Jaz Flowers is tackling a chicken-and-bacon burger and talking loudly about her love of Meat Loaf (''big fan''), fishing with her dad (''love it'') and how she once spent all day in bed watching episodes of Man vs Wild, the adrenalin-fuelled series starring SAS soldier-turned-Scout leader Bear Grylls (''all day''). A 23-year-old country girl, Flowers is an unusual music-theatre star. She's tall, buxom and mouthy. She doesn't stuff around with small talk and she can't abide rude people or anyone getting too serious. ''Too many people have a frown on their face. I mean, lighten up, people!'' she says. Her friends and colleagues variously describe her as ''one of the boys'' and as having ''the stamina of a diva''. She floors her fellow cast mates in Hairspray, in which she plays the lead role, the effervescent Tracy Turnblad, by heading to the gym after three hours on stage, dancing almost non-stop and belting out 15 songs. Flowers says she felt at home that night, performing to ''country people''. The song she yodelled was Patsy Montana's I Want to Be a Cowboy's Sweetheart, made famous by LeAnn Rimes. ''It's rare that you need to be able to yodel but it came in handy that night,'' Flowers says. Today she's at the uber-manly bike-culture cafe Deus Ex Machina in Camperdown, flanked by vintage motorcycles, sipping on a Coke. She's dressed in a blue-and-white-striped short T-shirt dress with white Doc Martens (no socks). She wears full make-up, with false eyelashes and a tiny beauty spot by the left corner of her pink-lipped mouth. ''I like a face,'' she says. It's a rare day off before the eight-shows-a-week Hairspray kicks in, a season that is likely to extend to several months, if not a year. Based on John Waters's 1988 film, Hairspray has won more than 30 stage awards worldwide. This production is not the Broadway version. It has the same Motown-inspired songs (by Marc Shaiman and Scott Wittman) and book (Mark O'Donnell and Thomas Meehan) but the staging, choreography, set and costume designs are all new. Directed by David Atkins and choreographed by Jason Coleman, the production uses ground-breaking LED video screens to bring the cartoon-colourful world of 1960s television to life. When Flowers auditioned for Tracy, she was winning rave reviews for her performance in Fame the Musical, playing another big girl, the gospel-singing Mabel. But Hairspray's producers were looking for a female aged 18, under five feet (152 centimetres) tall and a size 16-plus. Flowers was too tall, too old and too thin. ''I was never up for the role of Tracy. But I'm living proof that you can get almost any role if you can change the opinion of the producers with your performance,'' Flowers says, adding that she is ''costumed appropriately'' for Tracy - a polite way of saying she wears a fat suit under her costume. Flowers grew up in Morwell, Victoria, a town best known for its coal-fired power plants. Her father, Colin, worked as a tradie at a local paper mill and her mother, Vicki, ran a dance academy, where her older brother, Dallas, was a star tap dancer. Her father wanted to name her Jasmine (''but Jasmine is a flower and my last name is Flowers, so that's stupid''). It was her mother's idea to call her Jaz but with only one ''z'', so it didn't sound like jazz ballet. She started dance lessons at two and first sang on stage at four. ''My parents realised I was tuneful around four. It was a good start,'' she says. She studied musical theatre at Ballarat University - where she suffered terribly from homesickness, something she still grapples with daily, and that first job was an ensemble role in Shane Warne the Musical, a smash hit in Melbourne but a flop in Sydney. When Hairspray eventually closes, Flowers will have one eye on Broadway and the other on a record deal. ''I think I always wanted to be a pop star,'' she says. ''I'd love to be the next Beyonce - let's be honest, who wouldn't? I'd love to get a record deal. I love writing music and collaborating with other musicians. At the moment I'm in love with Adele and Jessie J. I'd love to do something that's unique and different - you know, show off my good bits. For now, she's more than happy to continue in musical theatre, a world she shares with her boyfriend, Alex Ellis, who performs in the jukebox musical Rock of Ages, now playing in Melbourne. She'd like to try straight acting, perhaps some Shakespeare. ''I'd love to do everything,'' she says. ''It just so happens that music theatre is where I fit at the moment and I'm having a really good time with that. ''Tracy is possibly the biggest role I'm ever, ever going to get. It is the most amazing experience ever to be the leading lady in a show. It's just - I kind of can't explain to you what it feels like. It's the best feeling in the world coming out for your bow every night. It is just the best feeling on earth. It's hard work, you know. It's really, really hard - three hours in a very, very big costume, and a hot costume, and you just don't get a break. Hairspray opens at the Lyric Theatre, Star City, on Thursday. Tracy Turnblad, a 16-year-old girl with big hair and a big dream, was first brought to life by Ricki Lake (later of talk-show fame) in the 1988 John Waters film, Hairspray. The 2007 movie version made a star out of Nikki Blonsky, who apparently heard she had scored the role while working in an ice-cream parlour. 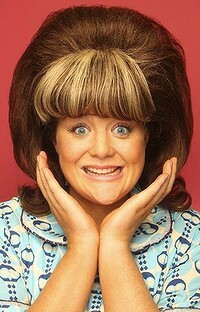 Flowers gained weight to win the role of Tracy but quickly lost it during the show's run in Melbourne. She wears a fat suit, sometimes with ice packs stitched in, to double her dress size.